a passion for reading started looking for a good work of fiction that featured a Citizen Airman as the hero. When he couldn’t find a book that fit the bill, he decided to do something about it: He wrote his own. 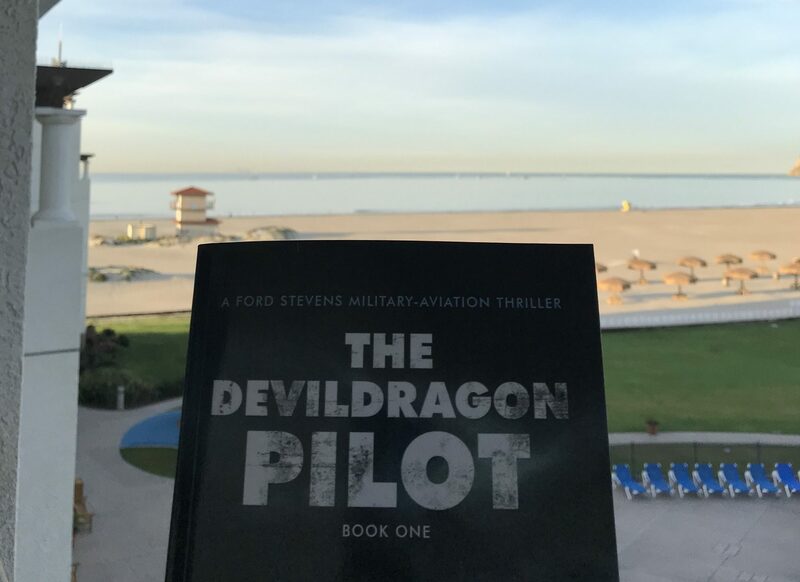 Col. Larry Colby, whose call sign is Cheese, recently completed writing “The Devil Dragon Pilot,” a military-aviation thriller that introduces the world to Ford Stevens, an Air Force Reserve B-1 pilot and world-class action hero. Here’s a brief look at what to expect from “The Devil Dragon Pilot,” taken from Colby’s website, colbyaviationthrillers.com: “Concealed deep within China’s inland borders is one of the most secretive airplanes ever own, known as Devil Dragon. She’s sleek, unbelievably fast and mysterious. Her test pilots have one mission in mind: make her test flights successful for operational use as soon as possible. Or sooner. The book was released in electronic, print and audio formats in December. “I had never written a book before, but I thought, ‘What the heck, let’s give it a shot,’” Colby said. For about a year, the colonel got up early every morning and wrote a page or two of his novel before heading to work at the National Defense University’s Eisenhower School. There, Colby, who is on an active Guard and Reserve tour, is a faculty member in the Strategic Leadership Department and co-leader of the Health Care Industry Study Program. of the Secretary of Defense (Personnel and Readiness) and Reserve Affairs, serving as a military assistant to the undersecretary and assistant secretary. He was also in the Office of the Assistant Secretary of the Air Force (Manpower and Reserve Affairs) as an executive officer and staff officer in Force Management Integration. The colonel said one of the best things about writing the book was the support he received from his family throughout the process. He said one of the hardest things about writing the book was finding a good stopping point each morning when it was time to get ready for work or head out for a morning run. Another tough part of the process was the Department of Defense prepublication review required of all employees who want to try their hand at writing. Colby is also proud of the fact that a portion of the proceeds from his book will go to a trio of veteran-related charities: Birdies for the Brave, Team Rubicon Global and the Headstrong Project. For people who check out “The Devil Dragon Pilot” and enjoy the book, there’s good news: Colby is still getting up at about 3:30 each morning and turning out a couple of pages before heading to work. He’s already well into writing the second Ford Stevens novel. Thank you very much, Citizen Airman and Air Force Reserve! Thank you! Read it! Awesome characters and story.